Big Mill sits amid acres of farmland and forest in the heart of the Inner Banks — the quiet coastal plain of eastern North Carolina. It's quality lodging in a peaceful setting that's just minutes from major highways and about two hours from Raleigh, NC and Norfolk, VA. A lush landscape where streams and rivers meander through cypress swamps and fertile farmland. Don't forget your camera. There are plenty of photo-ops. Much more than just a place to stay. With over 200 acres of grounds, you can walk through the landscaped gardens, explore the original farm outbuildings and wander through woodlands. Shaded by stately, ninety-year-old pecan trees that were planted by the owner’s parents, this Williamston Bed and Breakfast is in the original farmstead that has been in the family since 1920. A choice of five guest rooms & suites – all with private entrances and spectacular lake views. All can be rented long-term. Ask about long-term rental in our vintage Airstreams. The August 2017 print issue of Our State Magazine has a great article about Big Mill. Another Our State online article has a story about Williamston; this also includes another feature about Big Mill. Staying at Big Mill is not 'roughing it.' This idealized retreat offers what can only be called country luxury. Read what our guests say about their stay at Big Mill. 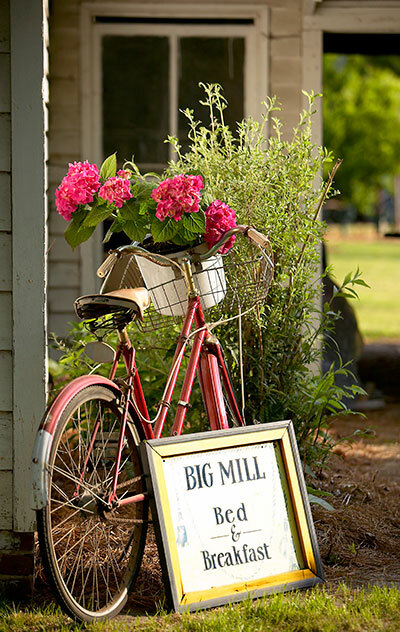 ABC News/Go featured Big Mill in their international list of "10 Eco-Friendly Inns for Earth Day" 2014. On NPR's Weekend Edition, Scott Simon interviewed innkeeper Chloe Tuttle on her recipe for making Snow Cream. Listen here. Some things are changing at Big Mill Bed and Breakfast in response to requests from guests, while other favorite things will remain the same. We now offer long-term stay (weekly & monthly) options at reduced rates for any suite or room. Breakfast is not included in long-term lodging, but innkeeper Chloe is happy to share her recipes for quiches, granolas, breads and other local dishes. Feel free to ask! Call the Innkeeper for current long-term rates. (252-792-8787) Click for details. For nightly guests at Big Mill B&B a continental breakfast is delivered to your room the evening before and placed in the kitchenette. This way breakfast is readily available when you awake at your leisure in the morning. Breakfast quiches of local sausage and slow-cooked N.C. grits, broccoli and ham, portabella mushroom and bacon, and zucchini and grape tomato are interchanged on the menu. Blueberries, blackberries, figs and grapes from the farm orchard are served in season. Chloe’s homemade Strawberry Jam, Candied Fig Preserves and Cinnamon-Blueberry Jam are made from the orchard’s fruits and are guests’ favorites. Homemade granolas are another popular specialty of Big Mill Bed and Breakfast. At Big Mill, the menu incorporates many locally grown foods and there is always variety. Innkeeper Chloe will also gladly share her recipes – just ask. Or check out her recipes here and follow Big Mill on Chloe’s Blog. For lunch and dinner, be sure to ask Chloe for restaurant recommendations.